Computers | WorstPlans.com updates every Monday! Are you tired of your computer MYSTERIOUSLY doing things in stony silence? Bring back 1980s retro charm and monitor your computer for malware and spyware with this ONE INSANE AUDIO TRICK! It drove an entire island of monks to madness! In the past, you could tell what a computer was doing (to some extent) just by listening to it. The fan would spin up if the CPU was under high load. You could actually listen to network traffic on a modem (or watch the network traffic light blink). Sometimes, different operations would cause a high-pitched noise to emit from some mysterious component of the computer. However, with solid-state drives and many entirely fanless computational devices (e.g. phones, most tablets), it is no longer possible to have an intuitive sense of what your computing device is up to. Fig. 1: Historically, computers would make all sorts of sounds when operating. The monitor would emit an annoying high-pitched hum, the disk would click and clack during reads or writes, you could listen to network traffic over a modem, and fan noise would let you know whether the CPU was working hard. The solution is obvious: the phone must generate artificial sounds so the user can figure out what’s going on. Heavy CPU use could result in the classic beeps of the “Star Trek computer sound“. Or for a subtler approach, a fan-spinning noise could be generated. Disk access could always be accompanied by the audio of a floppy disk reading / writing / seeking to a new location. The screen could cause a buzzing sound to be emitted when it was first turned on, and optionally at any time it was displaying a non-blank screen. Network access could generate a modem noise. Fig. 2: This phone is totally silent under normal operation, but we can add network noises, CPU fan noise, disk noises, and more. With this simple change, people will become aware of what their computer is doing. In particular, they will now easily realize if their computer is using a ton of Internet traffic or is infected with CPU-intensive malware. Demand this feature in your next phone! Or write and maintain a custom ROM for your phone. Easy! PROS: Warns people about phone spyware/malware. Makes a phone harder to lose, since it will be constantly emitting annoying sounds! CONS: None! It’s the perfect idea with no downsides. Bonus Wednesday Plan: Sponsored Server Hosting NOW WITH “SPECIAL OFFERS.” Monetize your command line with integrated banner ads! Help reduce the cost of running a server with SPECIAL OFFERS on your console / command line / anachronistic DOS prompt! Sponsored by GENERIC BRAND VIRUS_SCAN.exe . Command line banner ads are the future of paying for server time. Advertisements will be unobtrusively inserted, as seen here. Don’t skip these special offers—that would be THEFT AND STEALING and is extremely unethical and immoral, in addition to being contrary to the categorical imperative. Never get confused by your filesystem again, thanks to overly verbose documentation harassing you at every step. Also apparently no one uses filesystems anymore now that computers have become phones. Back in the ancient days before iPhones, people would store files in a hierarchical fashion in “folders” or “directories” on their computers. Sometimes, despite relatively descriptive folder names, it is not clear what a folder / directory actually is. For example, on Mac OS X, a casual user may be flummoxed by the presence of the “Library” folder on their hard drive, or surprised to see unusual directories for software that they perhaps installed but do not recognize. This is especially frequent when a program has support files under a company name. For example, if a person did not know that Photoshop was made by Adobe, they might be mystified by the sudden presence of many “Adobe” support files on their system. The proposal is simple: to allow descriptions of folders to be easily visible in the user interface. 2) since it is never used, it’s not worth checking for comments, because there won’t be any. 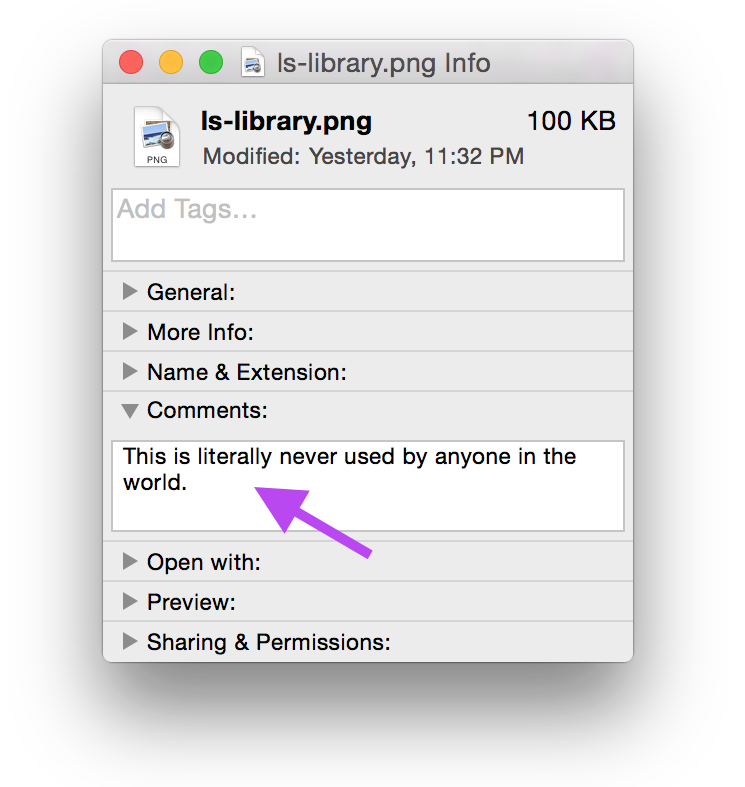 Fig 1: The Mac OS actually provides a built-in way of annotating a file or folder, but no one ever uses it, perhaps because it’s in a very out-of-the-way location. To fix this, we will attach comments to the folders in a more obvious fashion, as shown in figure 2. Fig 2: The gray region at the top of the window is a comment about the purpose of the directory. No more need to search online when you are mystified about which program created a folder, or whether it’s important to system operation. Another reason no one used Mac OS comments is that, historically, they were extremely easy to wipe out with certain common system-cleaning operations. We could make the annotation system more robust by simply storing the comments as an invisible file (perhaps “.dir_comment”) in the folder that the comment applies to. Fig 3a: In the terminal, a directory listing typically looks like this. If only we could easily discover what the “Library” directory was! Fig 3b: An “enhanced” version of Fig 3a, where the directory shows some information about itself to the user. Fig 4: This feature may be particularly useful when it comes to describing software that has been added to the system. For example, a user may be curious about the “TeX” directory, and wonder if it is an important part of the system, or if it was some piece of software they installed several system versions ago and forgot about. This would be easy to implement as a wrapper to the ls command that would print the contents of a file before printing the directory’s contents. PROS: This feature would promote sales of larger monitors, since all the documentation would crowd out actual on-screen content. CONS: It is likely that every description will be as cryptic as a typical UNIX man page (“manual page”). See bonus Fig 5 below for an example. Fig 5: With a clear synopsis like this, it’s obvious why the man page for “scp” does not bother to include any examples of how to use it.